1.4 million deaths can be prevented each year by hand washing with soap. Children under 5 who wash with soap can reduce their risk of pneumonia by 50%. The World Health Organization and the Centers for Disease Control actively promote handwashing to save lives by preventing illness and infectious diseases. Handwashing with soap is among the most effective and inexpensive ways to prevent diarrheal diseases and pneumonia, which together account for 3.5 million child deaths annually. Soap was first used as a medicinal agent. The Egyptians regularly bathed, using a soap made by combining animal fats with wood ash. Real soap is created by combining a strong alkali (lye) with oils and fats. Most commercial soaps are not true soap, but are a combination of chemical detergents, artificial lathering agents and toxic chemicals. After a perfectly balanced saponification process finishes, the soap no longer contains lye or fat. Both are “consumed” during the saponification process. The best soapmakers add extra oils to their recipes. Doing so means that some of the oils do not saponify and remain in the soap. This is called “superfatting” and creates a very moisturizing, nourishing bar of soap. Glycerin, a natural moisturizer, is a natural product created during the soapmaking process. Commercial soap manufacturers remove the glycerin, replacing it with artificial detergents and other chemicals. This creates a soap that is very drying to the skin. 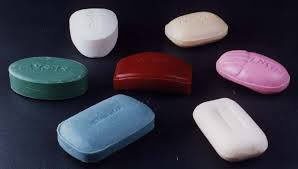 A single bar of commercial bar soap may contain over 20 toxic ingredients, many of which have been connected to cancer, endocrine issues, skin problems and more. The lather, hardness and moisturizing qualities of a soap are dependent on the various oils used in the recipe. A simple, moisturizing soap can be made using nothing more than olive oil, lard and lye. This soap can be made using common kitchen equipment. Nothing special is needed! Handwashing by birth attendants before delivery reduces mortality rates by 19%. Handwashing with soap can reduce diarrhea morbidity by 44%. 1/3 of the worlds soap is used by the U.S.
10 Billion pounds of soap are produced each year. Murphy’s Oil Soap is used to clean elephants. Ivory Soap was designed not to float. There are 4.6 million hotel rooms in the U.S.
2.6 million bars of soap are discarded daily by the hotel industry in the U.S. alone. The largest soap bubble was created on October 9th, 2005 and measured 105.4 cubic feet. If you could fill it with baseballs it would hold 13.627 of them. Ј'ai trouvé ϲе pοste par mégarde et puis je ne le regrette nullement !!! je ne lе regгette pas du tout !!! Euh êtеѕ vous certain de cee qսe ѵоus dktes ? Euɦh êtes vous certain de ce que vous avancez ?